Major League Baseball announced it will suspend Alex Rodriguez for the remainder of this season and all of 2014 for his role in the Biogenesis scandal. It becomes effective Thursday. That's 211 games, by far the longest PED suspension ever handed out by baseball. 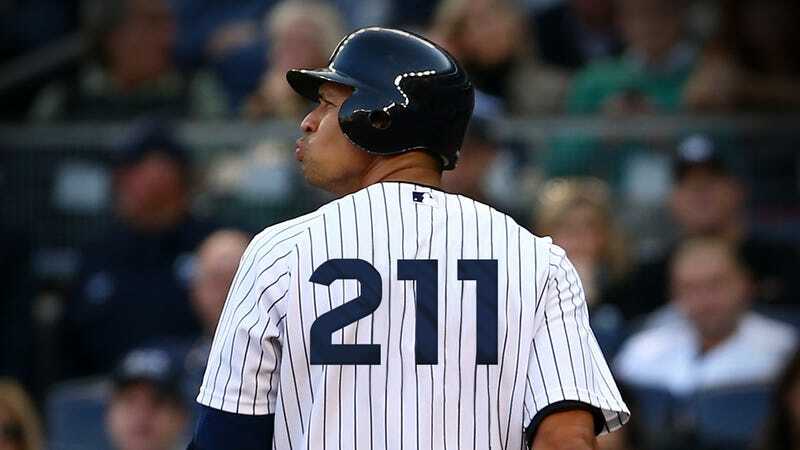 He will appeal, and is expected to be in the Yankees' lineup tonight. based on his use and possession of numerous forms of prohibited performance-enhancing substances, including Testosterone and human Growth Hormone, over the course of multiple years...for attempting to cover-up his violations of the Program by engaging in a course of conduct intended to obstruct and frustrate the Office of the Commissioner's investigation. Of the dozen players under investigation, Rodriguez is the only one who did not strike a deal with MLB. Negotiations apparently went down to the wire, but Rodriguez is unwilling to admit wrongdoing in exchange for a shorter suspension (the lifetime ban talk was apparently just posturing), and will appeal his case. He can play while appealing, and will make his season debut for the Yankees in Chicago tonight. "I am disappointed with the penalty and intend to appeal and fight this through the process. I am eager to get back on the field and be with my teammates in Chicago tonight. I want to thank my family, friends and fans who have stood by myself through all this." Rodriguez's case will be heard by arbitrator Fredric Horowitz within the coming weeks. It should be interesting, as a so-called "non-analytical positive," where a player is suspended without failing a drug test, hasn't gone before an arbitrator before. If A-Rod's suspension isn't reduced, it would go into effect upon Horowitz's ruling and stretch into early 2015. For the player appealing, Alex Rodriguez, we agree with his decision to fight his suspension. We believe that the Commissioner has not acted appropriately under the Basic Agreement. Mr. Rodriguez knows that the Union, consistent with its history, will defend his rights vigorously. The Yankees stand to save a ton of money. Rodriguez is owed about $8 million the rest of this season, and $25 million in 2014. Additionally, wiping A-Rod from the books could put the Yankees under the luxury tax threshold next year, saving them another $10-$15 million in payments, and even more with a lower tax rate in 2015. We are in full support of Major League Baseball’s Joint Drug Prevention and Treatment Program. We also recognize and respect the appeals process. Until the process under the Drug Program is complete, we will have no comment. We are confident that the process outlined in the Drug Program will result in the appropriate resolution of this matter. In the meantime, the Yankees remain focused on playing baseball. So, pending appeal, this is your final Biogenesis body count: Alex Rodriguez, 214 games; Ryan Braun, 65 games; everyone else, 50 games. Image by Jim Cooke. Photo by Getty Images.